Cycling holidays for singles have become increasingly popular in recent times, with a growing number of individuals seeking to travel alone, but ride within a group. For some, this may be due to the simple reason that neither friends nor family share their enthusiasm for cycling, and for others it is a way of meeting new and like-minded people, whilst participating in cycling adventures. I’ve just turned 40 – I’ve discovered Lycra – what’s to do….. GET ON YOUR BIKE! 8 July, 2015 By 7pxadmin in Road Cycling Holidays Comments Off on I’ve just turned 40 – I’ve discovered Lycra – what’s to do….. GET ON YOUR BIKE! It’s that time in one’s life when it feels like the good years are behind you, but the great ones are ahead. You need a challenge, something to show yourself that you’ve still got what it takes to bring muscle power and will power together. But you also want to give back to the world around you. A charity bike challenge is just what you need. If you are reading this, the chances are you own a bike, love to get on your bike and relish the idea of a challenge on your bike! It’s not a challenge to be sniffed at – it’s a trip that takes in just over 1000 miles of some of the most beautiful countryside of the British Isles. You will cycle through North Cornwall, cross the River Severn, taking in the scenic views of Herefordshire, and on into Northern England and up to the Scottish Border. Pass through the hills of Southern Uplands, and, if you have the energy to lift your hands off your bars, wave to ‘Nessie’ as you near your final destination – John O’Groats. Phew! But it’s not all in one go; at the end of each day there is a bed and a hot meal waiting for you. So you may not complete the trip in 44 hours, 4 mins and 20 secs as done by Gethin Butler in 2001 but by riding with Bike Adventures you will be in very safe and experienced hands. 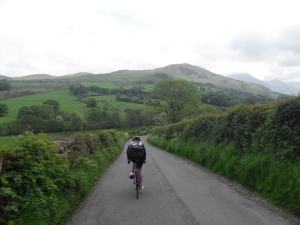 Our trip durations range from 9 days for very experienced cyclists, through 15 days to a more leisurely 21 days for those with time to relax and enjoy the beautiful British scenery. 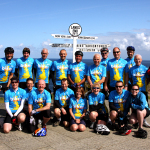 Bike Adventures have been running the LEJOG tour for over 14 years and can help you every step of the way in getting your charity challenge off to a racing start. From the initial advice about training plans and the best way to go about fundraising, to having the best tour guides in the business, we are there to assist you. 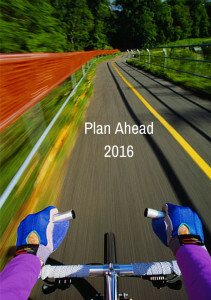 It may seem as if we are only in the early stages of 2015, but thinking about your adventures for next year can be great planning. 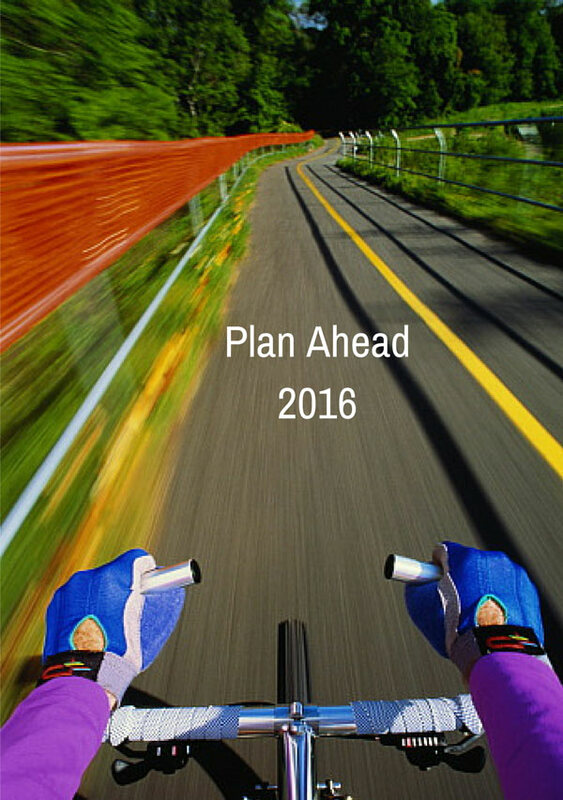 If you’re already thinking about your cycling holidays and like to plan ahead then read on…. The team at Bike Adventures have been out around the world trying out new routes, testing out the beds in the new accommodation and seeing the beer and wine are up to scratch. Now this is a not as much fun as you might think, it is a role we take very seriously – at the end of a long days cycling the last thing you need is a warm beer and a dodgy B&B. The route itself also takes careful consideration, much exploration and often hours extra in the saddle to find that glorious country road with a shady avenue of trees or a slight detour to fit in a valley view that will give you a memory and photo that takes you back there for years to come. Some of the many things though that make our holidays special is the other riders, friends for life are made, the tour guides who have an insatiable passion for cycling and sharing this with their fellow guests and the people you meet on the way – when we stop for refreshments or to bed down you can be sure we have picked that spot because of the great hospitality and shared love of the local countryside – we meet many characters along the way. Some of our routes may have been running for more than 10 years and the team still enjoy riding them now more than ever. The popular routes do become favourites and are often on a ‘must do’ list of classics for a lot of riders, if you missed out on your bucket list tour this year or the date clashed with Auntie Clair’s wedding then no worries, drop your details into our email list box on the left and be the first to set eyes on the cycling holiday calendar. As a small island, the UK provides the perfect backdrop for coast to coast holidays (C2C) as well as ‘end to ends’. Many cyclists are keen to tick each of these challenges off their bucket lists; here at Bike Adventures we were left unsatisfied by the trips published in the guidebooks so came up with our own. We felt that existing routes were too short and repetitive, and they didn’t make the most of the beautiful scenery that England has to offer. Our own unique routes are the result of our discord and will take you (and your bike!) from the East coast of England to the West coast. Our main coast to coast holiday route covers just over 360 miles and, depending on the tour you select, can take anything from 5 to 14 days! We wanted cyclists to be able to truly experience the diverse nature of the English landscape so we have carefully devised routes that meander through beautiful villages, follow the shimmering canals and experience the undulations of the countryside in one tour. There really is no better way to experience this landscape than on a bike! Our main C2C trip begins in Lowestoft on the North Sea coast, the most easterly point in the UK. From there we head inland and travel through pretty villages and past canals and windmills into Cambridgeshire. Where possible, we try to avoid major roads and towns with safety in mind – this brings the added benefit of time and space to fully appreciate the scenery with its changing aspects depending on the weather. We then weave our way through central England’s rugged countryside where you’ll notice the route becoming increasing hilly as we approach Northamptonshire. If you are an inexperienced rider but the coast to coast is on your wish list, do make sure that you have prepared for the hills you’ll encounter – our guides will also be there for moral and material support all the way. The route takes you through Shakespeare’s birthplace in the historic town of Stratford-upon-Avon and then into the north of Worcester. As we approach Herefordshire and cross the border into Wales, the riding gets a little more challenging but the stunning scenery you’ll encounter will more than make up for it. Our end point, St David’s Head, juts out into the Irish Sea and is considered the most western point in the UK. The small town of St David’s, with its dramatic coastline and spectacular sea views has been a major place of pilgrimage since the Middle Ages and is a fitting place to end our trip. Raising a glass at the end of the tour is exhilarating – another achievement in the bag, lifelong friends made and legs like jelly, what more could you want from a cycling holiday? 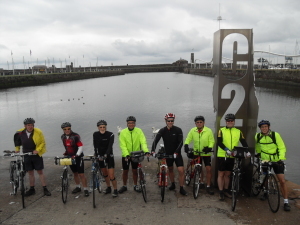 If you would like to tackle our coast to coast route, take a look at the range of tours we have to offer. Our tour guides are knowledgeable and have an infectious enthusiasm that fills every trip with fun and adventure. If you have any questions or would like to discuss your cycling holiday in more detail, please don’t hesitate to get in touch. 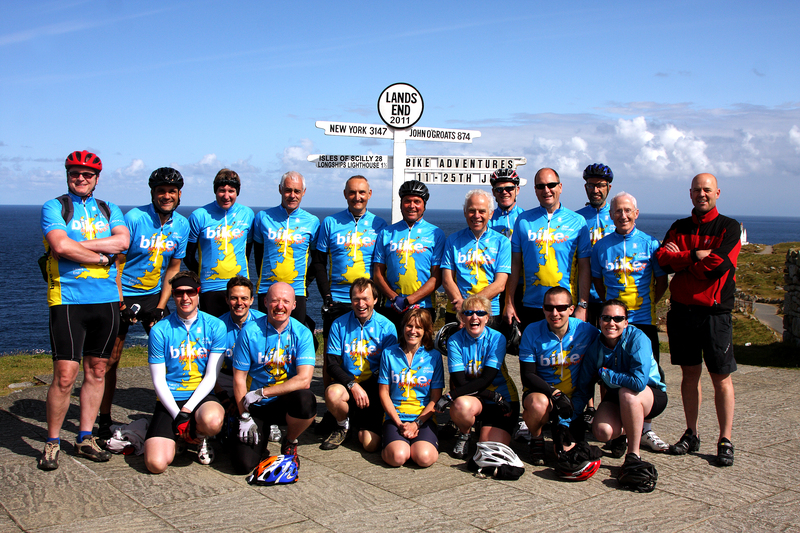 Lands End to John O’Groats: What’s it all about? 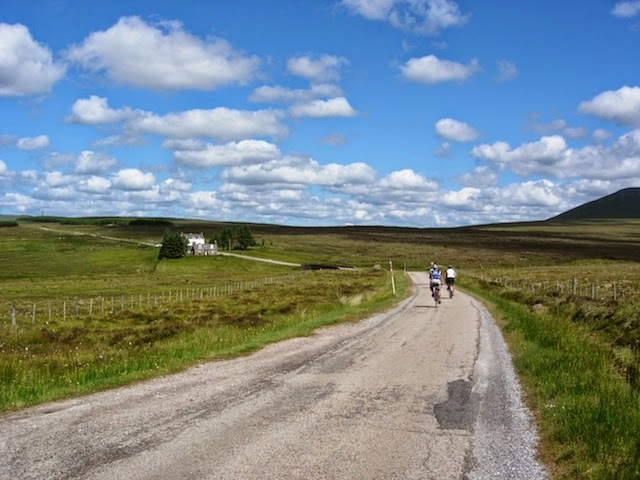 23 February, 2015 By 7pxadmin in Road Cycling Holidays Comments Off on Lands End to John O’Groats: What’s it all about? For many people completing the famous route from Lands End to John O’Groats, also known as LEJOG, is a lifelong ambition. Riding from the very southwest of the country to the tip in the northeast is an incredible achievement, but it certainly isn’t a challenge to be taken lightly. The acclaimed journey dates back to the 1870s when two brothers walked the distance! However, the route didn’t become a well traversed one until the 1960s. Since then, completing the ‘End to End’ has become a challenge that many people want to complete. The traditional distance by road is 874 miles and takes most cyclists 10-14 days, however there isn’t an official route to follow so the ‘End to End’ distance can vary. At Bike Adventures, our tours tend to be just over 1000 miles, where possible we try to avoid major roads and traffic. This gives you the chance to truly experience and appreciate the beauty that can be found in the English countryside. The fastest time recorded on a conventional bicycle was set in 2001 by Gethin Butler, who completed the distance in just 44 hours, 4 minutes and 20 seconds. Don’t worry, our tours give you a little more time to travel from end to end! Depending on your own personal preferences and level of experience, you can choose to complete the distance in as little as 9 days, or if you’d prefer to take a more scenic route, you can ride it in a leisurely 26 days. The trip traditionally begins in Lands End because it gives you the opportunity to take advantage of the winds that predominantly travel from the south-west of the UK. If you’re lucky, you could be flying all the way to John O’Groats! However, you can do it all in reverse and tackle the steep inclines found in Devon and Cornwall at the end of the trip, when you’ll probably find that your fitness has improved too by then. In taking on this big, bold challenge, you’ll be following in the cycle tracks of former England Rugby Captain – Lewis Moody and Olympian – James Cracknell. The route has also been tackled by David Walliams, Jimmy Carr, Fearne Cotton, Miranda Hart, and other celebrities as part of a team relay to raise money for charity. If you fancy getting on your bike and riding from one end of the country to the other, get in touch with our knowledgeable team and we can help you to achieve your goal. It will come as no surprise to you to see that ‘weather’ is at the top of our list of considerations for UK tours. Our infamous and unpredictable weather is going to play a big part in your trip, and so it should also form a significant part of your kit list. Depending on the time of year that you’ll be riding, you’ll need to pack a range of clothing that will enable you to ride comfortably and enjoy your holiday. Despite the UK’s bad reputation for poor weather, it is not uncommon to experience long periods of hot, dry weather. In these situations it is imperative you have a supply of light clothing available to you. You’ll also want to have sunglasses and sun block handy. However, you may also experience the characteristically wet weather (sometimes in the same day as glorious sunshine!) and for these occasions, you need to be well equipped with clothing that will keep you warm and dry. For those of you who have opted for the UK Coast to Coast tour that will take you through the notoriously wet Wales, you’ll particularly want to take note! Many of our tours will leave you riding for long periods of time in very exposed areas so pack a supply of waterproof and windproof clothing. Due to this exposure, it is advisable to carry additional clothing with you. 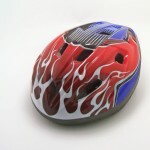 The need for first aid and a bike tool kit will vary according to the level of support provided on your holiday. Fully supported tours are accompanied by a support vehicle, containing a comprehensive tool kit, spare parts and a first aid kit. However, the support vehicle doesn’t follow closely behind the group and it is still advisable to equip yourself with a basic first aid kit and tool kit. 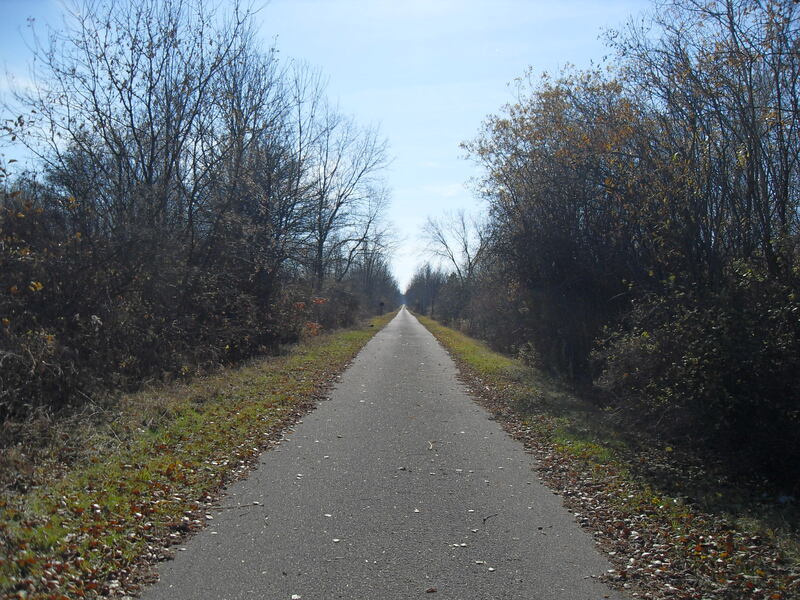 If you are riding an independent route, then your level of supplies will naturally be much higher. Be sure to pack yourself spare parts, tools and a first aid kit. Unsure about what is included in your holiday package? Take a look at the ‘What’s Included’ tab on your tour page or get in touch. Depending on how you plan to reach the start of your holiday, you will need to ensure that you pack your bike to meet with airline, or train company’s guidelines. Bikes should be packed securely in a box or bag and you can expect to have to remove pedals. For an additional fee, we can save you the hassle of transporting you bike and deliver it to the starting point of your trip. All you need to do it pack up your bike and we’ll sort the rest. At the end of your holiday, we’ll arrange to drop you bike back home to you. The need to stay well hydrated during your tour goes without saying, a water bottle is a vital part of your kit list. For those of you who are on a fully supported tour, the support vehicle carries water on board for you to top your bottles up. Breakfast is included in all our UK holiday packages and restaurants or pubs are easily found near your accommodation each night. Guides will also highlight suitable places for you to grab a bite to eat, but during some tours these places can be few and far between so it is a good idea to ensure that you have a supply of snacks and energy bars. 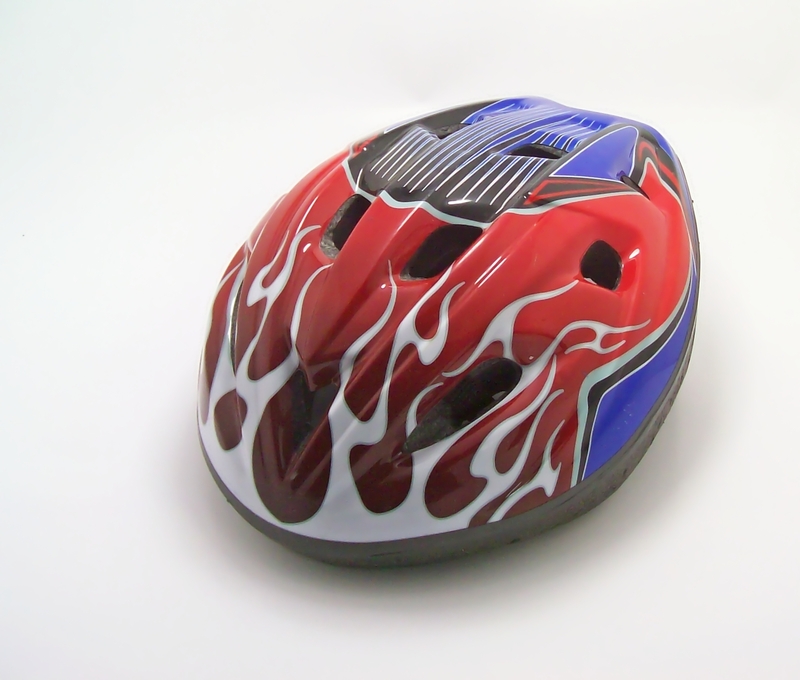 Although helmets are not compulsory on our tours, we do highly recommend that you wear one as an added safety precaution. You might want to consider (if you haven’t already) purchasing high visibility clothing. Although you generally won’t generally be cycling in the dark, high vis clothing is useful for the days when the weather comes rolling in. As well as all the equipment you need for yourself and your bike, you’ll probably want to carry some money, a mobile phone and a camera. If you are a UK resident then taking out insurance is optional for most of our trips (excluding the Ireland, Mizen Head to Malin Head trip), however you may want to explore the cost of getting basic cover. We hope this helps to get you started with you packing but if we’ve missed anything, please feel free to get in touch.